An intricate and unusual 7-loop braid —the word for braid was spelled some funny ways in the 17th C. manuscripts— is the basis of the 14-loop alphabet braid. Spanish samplers, bicolor loops, dmc embroidery floss. Joy Boutrup described this 7-loop braid in her recent groundbreaking analysis of the 17th C. letter braids. The so-called ‘directions’ in all the 17th C. loop braiding manuscripts assumed a lot of previous knowledge on the part of the reader! The 14-loop letter-braid of my two previous posts is a doubled (two-braider) version of this 7-loop spanish braid. Apparently, this 7-loop braid was never described on its own in the old manuscripts, only as part of this doubled version, in the directions for making a particular type of letterbraid. (Two braiders cooperating—each braiding a 7-loop spanish braid, and trading their nearest index-finger loops after each cycle in order to connect their work into one braid). I made a few of the 14-loop letterbraids using a solo-braider workaround method, and following Joy Boutrup’s charts for the letter-shapes. Then I got curious about how this braid would look without the letters. I decided to start with the component 7-loop braid. (The only difference was that I turned all the loop transfers—since I wanted a solidly rectangular braid-shape rather than the two-divided-layers of the letterbraid version.) Seven loops, bicolor, in just two colors. You don’t have to use bicolor loops to make this braid, btw, I was just curious to see what patterns they would make. First I made a few pattern samplers of the 7-loop braid, then I made a sampler of some of those patterns doubled into a 14-loop braid. A spanish braid requires four loop-transfers with each braiding cycle—twice as many as a square braid. Even though these transfers are performed by a single braider, this is very similar to the 2-braider, doubled square braids of 10 loops in the old braiding manuscripts, the ones called “purse-string with the wave” or “with crowns”, etc. They also have four loop transfers per braiding cycle… The old documents didn’t have a general term for these braids, only for some of their color patterns. I’ve been calling them double braids, based on Masako Kinoshita’s term “double-square braid” for a similar kute-uchi braid. You can see two traditional double braid color patterns in my two 7-loop samplers (see above). The sections with lengthwise bands of color are like the “Edge” pattern, and there’s a slightly lopsided “Crowns” pattern—lopsided because of the odd number of loops. The only thing I varied was the dark/light arrangement of loops at the beginning of each pattern, the braiding method is the same throughout all the patterns. I liked the 7-loop braid variations in themselves, but it was really fun to see how they came out when doubled into a 14-loop braid. Whole new patterns emerged. I’m starting to think about making a long, less crowded sampler in heavier yarn for an instrument strap that a friend has been requesting. There are still more patterns to try…. Even in a square braid there’s always a slight widening of either the top or bottom layer of the braid depending on which direction you turn your loops—turning them from above makes the back wider, turning them from below makes the top wider (see pics above). It gives this braid a tendency to curve a little. I think that’s also why the weave looks different on the two sides. I should probably try making some samples with half of the loop-transfers in each cycle turned from above and half from below. [see footnote below] This is not a very appealing idea… I’d much rather try some more color patterns! I also want to try doubling some of these same patterns, but off-center so they don’t have mirror-image symmetry. 2-14-12 New info: it turns out that indeed the braid will be completely straight in cross-section if all the loop transfers on the left side are turned clockwise and all the ones on the right are turned counterclockwise. Or vice versa. Thanks to Gary in the Canary Islands for pushing me to confirm this! This means a completely even mix of turns from above and turns from below on both sides of the braid. On the left half of the braid, all the loops that are being pulled toward the right will get a turn from above, while all the loops that are being transferred toward the left will get the equivalent of a turn from below. In both of these cases the resulting turn is actually in a clockwise rotational direction, as seen from the braider’s point of view. The opposite will hold for the right half of the braid. This principle holds even for the component 7-loop braid–in fact so far I’ve only tried this on the 7-loop braid, haven’t actually warped up and made my 14-loop trials yet. [Yes, same result with the doubled braid.] But the results are very conclusive with the little 7-loop braids, they are so straight, with such neat, squared-off edges when the turns are done this way… And I had already found this to be the case with my “Rainbow Girl” braids, which have even more loop transfers per cycle than the 14-loop doubled spanish braid. I don’t know why I was so reluctant to try this out initially! It’s very simple to do, no big deal, and makes a big improvement in the appearance of what are already very attractive braids. Both braiders would turn loops from ABOVE on all the outer hand’s loop transfers, but turn from BELOW on the inner hand’s loop transfers. Left braider’s left hand is outer, right braider’s right hand is outer. Updates — My next post “Why Spanish?” has instructions, now including a video tutorial, for the 7-loop Spanish braid. It’s just for the braiding moves—you would still need Boutrup’s letterbraid monograph, and a braiding partner, to make the letter-shapes. (There’s a chart for each letter that shows when to turn which loops). I made the tutorial so this great 7-loop braid could be more widely known, and also to help readers with the instructions in the Boutrup/ Speiser monograph. The instructions assume a familiarity both with loop braiding, and with interpreting written instructions for loop braids. That’s because the monograph was written as a supplement to Speiser’s OEPBforLB (see below) which includes detailed loop braiding instructions. [Parts I and II are separate publications—II is the one on letter braids. Available from BraidersHand. They are supplements to OEPBforLB, with new research and discoveries] —NOTE: Vol.s III and IV are now out, but I haven’t read them yet—will be buying them in Aug at Braids 2012. Noémi Speiser’s Old English Pattern Books for Loop Braiding, 2000 —link to my review of this book, as well as her Manual of Braiding. Thank you, do you have any information about Tibetan braiding? I saw beautiful black and white braided rope in Tibet. That’s so great that you got to see a Tibetan braid while you were there! The Himalayas and the Andes are the only (known) places in the world where a very unusual type of “fist-braiding” is done, which can create thick, solid braids with beautiful and intricate patterns, so I’m guessing that’s what you saw. In both places, these were/ are used for making a weapon called a sling – also used as an important ceremonial and dance accessory, often with decorative pom-poms attached. Traditionally braided by men. To me its a really amazing coincidence that this technique developed in two such separate places and was used so similarly! If you check out the link below to Laverne’s tutorial to see how the braids are made, you’ll know what i mean – it’s a very unusual method. Slings are worldwide, but not this braiding method. There are books on Andean sling braids, but I don’t know of anything specifically on Tibetan sling braids (anyone else know of a source?) I think Rodrick Owen refers to Tibetan sling braids in his books. Noemi Speiser’s classic Manual of Braiding mentions them. 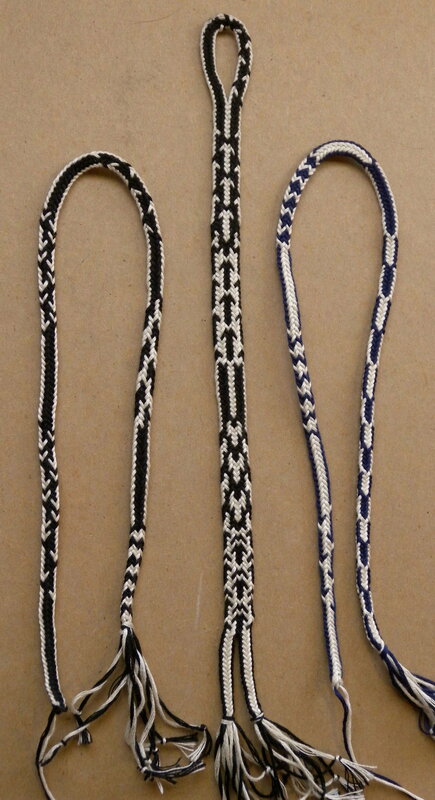 Rodrick Owen’s two recent books on Andean sling braids have tons of patterns and a lot of history (more history in the second book). There’s also an older but still-available book by Adele Cahlander on Andean sling braids. Laverne Waddington has an online tutorial for two different patterns. She teaches the traditional fist-braided method, whereas Rodrick Owen’s books teach how to make the same type of braid but using a slotted card or a braiding table as an aid. Here in California I’ve seen smaller, tourist versions of Tibetan braided slings in Tibetan import stores, and once I got to see the real thing – a hefty and stunning authentic one – black and white, real wool (maybe yak?) whereas the cheap tourist ones I saw were made with colorful synthetic yarn. Please let me know if you find any sources of info on Tibetan sling braids, I’d love to know more about them! I was mystified and loved the look of the ones in Tibet (1994), but I wasn’t able to get an up close view. They were richly patterned and likely made from yak wool. They were in natural yak wool colors. I would have brought one home if I’d been able to find one in a market.